Sensei Youssef is from Casablanca, Morocco. He studied Shotokan Karate as a teenager and began studying Aikido after attending an Aikido Seminar in 1988 with Hombu Dojo instructor and original student of O'Sensei, Tamura Sensei. Youssef was inspired by his power and skill with larger opponents, regardless of his smaller stature. He began studying Aikido seriously and became an instructor, opening his first Aikido dojo in Casablanca in 1993. 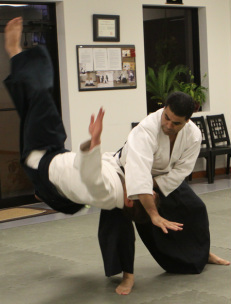 Youssef moved to New York in 1999 and taught Aikido at the University of Rochester, New York. 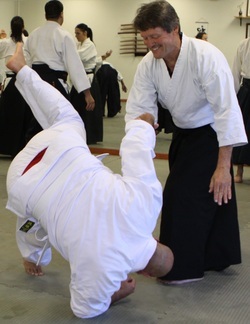 After working for the NYS Department of corrections for four years, he moved to Central Florida and opened the Sadkane School for Aikido in 2007. The Sadkane School for Aikido became a USAF member after meeting Sensei Peter Bernath, 7th dan Shihan, technical committee member. This led Youssef to train with the dynamic USAF founder Yamada Sensei, 8th dan Shihan, original student of O'Sensei, and the incredible instructors which are part of the organization. He regularly attends and is a guest instructor at local seminars, and travels to Japan to train with Doshu and the instructors at the Hombu Dojo, to continue his training. In 2012, Youssef spent 6 months in Taiwan and taught Aikido at Wagor Bilingual High School in Taichung. Originally from New York, Rain has a Master of Fine Arts degree in Dance, and is a FL-certified educator. She has taught in universities, middle and high schools in a wide variety of subjects from dance technique & choreography, injury prevention, yoga, functional anatomy, world studies, ESL, and Aikido. Rain and Youssef have 2 sons and practice Aikido as a family, with Youssef as the chief instructor. In 2012, they all traveled to Taiwan to live, with Rain & Youssef teaching at Wagor High School. Besides training in dance since the age of 5, Rain has also trained in other martial arts, including Oshin Ryu Karate and Ninpo. Rain received her first blackbelt in Korean-based, combined martial art, Oom Yung Doe. She was introduced to Aikido by her husband, Sensei Youssef, in 1999, co-taught with him at the University of Rochester in 2001, and began the Aikido kids and teens program when they opened the Sadkane School for Aikido in 2007. Rain directs the kids/teens program in Aikido, and teaches yoga, dance, combined martial arts, and adult basic Aikido classes at the Sadkane School for Aikido. Rain currently directs the Dance Program at Lake Howell High School in Winter Park, FL. With the belief that Aikido has a positive influence on the lives and paths of teenagers, and with the use of the beautiful dance facilities, Rain has become certified in Physical Education to teach the only Self-Defense course in the Seminole County Public School system. 5th degree blackbelt began in 1981 under the instruction of Sensei Peter Bernath, Shihan and Sensei Penny Bernath, Shidoin at FL Aikikai in Ft. Lauderdale. Sensei Mike also holds a black belt in a Korean-based combined martial art and is a certified psycho-therapist. 1st degree blackbelt grew up in New Jersey and began training as a kid in the United States Aikido Federation. Chris studied under Chester Griffin at Long Island Beach Aikikai, along with his father, who is YonDan. Sensei Chris practices yoga and participates in the annual Tough Mudder competition and local triatholons. Chris and his wife Alicia have a beautiful daughter, MeiLing and son Jaden.